This page attempts to document the many companies and institutions that have helped us with funding and/or with expertise and advice. We’ll try and keep it up to date, but please forgive inevitable omissions; if you think you should be here, let us know! But first, a word about the thousands of individuals who have helped us since 2008. The idea behind ColaLife sprang from an observation from co-founder Simon Berry, over 25 years ago, that Coca-Cola is often available in remote villages in the developing world, yet simple lifesaving medicines, like Oral Rehydration Salts are not. The idea remained just that, until, with the advent of Social Media, there was a way to promote and discuss that observation and its potential to save lives, and to convene people and organisations willing to turn ideas into action. So, our Supporters Page must start with a huge Thank You to the thousands of individuals – too numerous to mention – who have given time, expertise and money to turn an idea into reality. You all know who you are, and nothing would have happened without you. You helped to get the BBC’s attention and they engaged Coca-Cola. You have challenged, argued, donated, written, tweeted, advised, filmed, recorded, networked, and given us audiences all over the world. That’s how this amazing journey started and has continued to develop. ColaLife intends to remain small – and our power comes from our supporters. So, please like ColaLife on Facebook. London solicitors Allen & Overy gave pro-bono help for ColaLife to achieve charitable status in 2011. They continue to provide free meeting space for our Trustees in London, as well as the services of our legal issues specialist, Board Member Emma Danforth. We also received a grant in 2014, to help pilot Kit Yamoyo in Lusaka. Amcor donated the specialist breathable sealing film for the first ‘AidPod’ design, and have gone on to design – and donate – the packaging for the Kit Yamoyo flexi-pack. The team working with ColaLife won The Amcor CEO’s Outperformance Award – enabling them to make a cash donation of $5,000 Australian dollars to us in 2014. Together, we are short-listed for UK Packaging Awards: Resource Efficient Pack of the Year 2015. The international network of Social Entrepreneurs has followed our development since ColaLife won the Making More Health Award in 2011. Our co-founder, Simon Berry, was elected as an Ashoka Fellow in November 2015. Boxwood staff provided us with a strategy day in 2010 and continue to support ColaLife’s progress with contacts and personal donations. Various BBC radio programmes have aired our work, including the team at iPM, who helped us make the first contact with Coca-Cola in 2008; Peter Day who met us at the Design Museum awards and came to see our work in Zambia in 2013; and several times on the World Service, including Claudia Hammond on Health Check. This UK family foundation and its US counterpart have been a tremendous source of encouragement for ColaLife’s way of working, providing a vital source of funding to take us beyond on-the-ground projects, supporting ColaLife’s development and dissemination work. CHAI staff from various countries have been very helpful in exchanging experience on ORS and Zinc design. CHAI’s focus group work in India, Nigeria and Uganda included customer testing for our proto-type ‘flexi-pack’ design and provided valuable feedback and insights. Contextly is a ‘content recommendation’ system which runs on our website. It automatically places links to related pages (posts) at the end of all our blog posts and so enables visitors to move easily from one page to another that they might be interested in. It also provides anonymised daily, weekly and monthly reports on posts read, how many people scrolled to the bottom of blog posts and which link they clicked on next. This obviously takes some processing power but this all done on the Contextly servers, not ours, so there is no speed penalty from using Contextly. Contextly is a paid for service but Contextly support ColaLife by providing their service to us for free. Contextly offer a 21-day free trial. DataKind UK, the UK data-for-good community linked us up with Abbott Katz a data scientist and Excel expert who worked with us in a voluntary capacity to create a dashboard to bring alive the data being collected by frontline workers as they support wholesalers and retailers who carry the Kit Yamoyo product. These dashboards are published periodically here. Design Engineering Solutions is run by Dave Salmon. Dave was a member of the original ‘AidPod’ team at PI Global and in Dec-16 offered to work on a pro bono basis on the retail display solution for the Kit Yamoyo flexi-pack. The UK’s Department for International Development was majority funder of the ColaLife trial (COTZ) and went on to support our work after the trial to keep kits flowing in those areas while we sought funding to scale up market development. DfID is currently majority funder of both projects to develop public and private sector markets for Kit Yamoyo in Zambia: KYTS-ACE and KYTS-LUSAKA. Digital Leaders is the UK-wide Digital Transformation initiative. It promotes digital know-how, thought leadership and sharing best practice around Digital Transformation across all sectors. It is the UK’s premier platform for expert opinion and networking for a community of 40,000 members. Since 2014 ColaLife has been the beneficiary of the raffle at the annual award ceremony and dinner. Each raffle has contributed around £2,500 to our work. DS Smith is a leading provider of corrugated & plastics packaging, supported by paper & recycling operations employing 26,000 people across 36 countries. DS Smith are helping us on a pro bono basis with the development of an appropriate ‘Shelf Ready Pack’ for the distribution and display Kit Yamoyo on retailers’ shelves from supermarkets to remote community retailers. Ernst & Young staff from South Africa and London have helped with volunteer time and contacts. This US start-up, manufacturing healthy hydration drinks, funds discount vouchers for ColaLife’s Kit Yamoyo from a proportion of their profits, as part of their CSR model. As they grow, we get more funds, in a real win-win partnership, which includes learning on scaling up distribution. See Our partnership with Everly. ColaLife has collaborated with various GSK staff over the years, who have helped us to understand how global pharmaceutical players work. In 2014 ColaLife won the GSK/Save the Children Healthcare Innovation Award. The cash element of this prestigious award has already helped us to start two new projects in Zambia and lever in significant additional funds (eg from DfID). ColaLife uses Huddle for day-to-day project management and we pay for this. However, Huddle provide the platform for are Open Access Initiative on a pro bono basis. This enables us to share our designs and learning and also enables us to support those we are sharing with. The Impact Journalism team has featured ColaLife’s story and helped with press liaison and leads. The first corporate donor to ColaLife’s Zambian trial (COTZ), and a donor who has stayed with us through the tricky transition from trial to scale-up, the Johnson and Johnson Corporate Citizenship Trust and the J&J Family of Companies continue to help us with funding, advice and two-way learning opportunities. We were the first ‘outsiders’ to take part in their ‘Innovation Bootcamp’ in 2010-11. Together, we won the FT Innovation in Finance Award in 2014. Our most recent collaboration in 2015 was sharing lessons from the trial and early market scale-up with their employees and management teams. We’ve been using Moo’s magnificent printing service for our illustrated business cards since 2009, with a generous charity discount. ColaLife won the inaugural Moo Award in 2012, which gave us a year’s free printing, used to fund the first batches of our Training Cards for retailers and health workers. The first packaging company to offer us their design expertise, PI Global designed the first ‘AidPod’ as attractive, functional packaging for the first Kit Yamoyo, used in our trial. They introduced us to Amcor, and have gone on to support ColaLife with networking, contacts and pro bono advice. They introduced us to the prestigious Dupont Packaging Awards, and together we put in the Diamond Award winning entry in 2013. Awards are great to spread our message on the importance of health product design for the developing world. We have enjoyed the support of Polymer Containers since 2013 when we started collaborating to produce the ‘screw-top’ container for the top-end version of Kit Yamoyo. Our collaboration was highlighted in Our Top 10 Achievements of 2013. The support of Polymer Containers went beyond fruitful and enjoyable collaboration when they offered to cover the cost of the mould for the ‘screw-top’. This is a significant contribution from a small Zambian business and we are very grateful. Unfortunately, the economic difficulties in Zambia, including a rapid rise inflation has meant that we have had to put the production of the screw-top version of Kit Yamoyo on hold for the moment. However, in the meantime, we will be using ‘screw-top’ measuring containers as promotional items. As the Coca-Cola bottler in Zambia, SABMiller provided local insights into their distribution model and a donation towards the COTZ trial, as well as sharing their training manual for retail staff, to help ColaLife frame retailer training for the small shops selling Kit Yamoyo. The company continues to support our fundraising and networking events with refreshments in Zambia and in UK. Also see: SABMiller confirms commitment (07-May-11). The RSM were an early supporter and gave ColaLife’s Simon Berry a platform for sharing the initial thinking behind ColaLife at one of their Innovation Briefings in Feb-11. More recently, in Sep-15, Simon Berry presented at the 11th Annual Medical Innnovations Summit. See: Medical Innovation – Kit Yamoyo and its value chain. These events have helped establish ColaLife’s credibility. See also: The Royal Society of Medicine: innovation and ColaLife. UK charity Sound Delivery has helped by featuring our work in Case Studies and presentations. Staff have generously contributed to our work with individual donations. UNICEF staff in Zambia and internationally have offered help, advice and exchanges of experience since 2010. 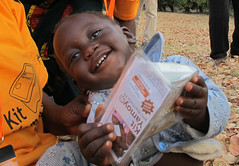 UNICEF Zambia helped us to design the first COTZ trial and went on to oversee its monitoring and evaluation. We have since been able to meet UNICEF innovation teams in London and Copenhagen, to seek practical ways to feed our findings into their procurement models. WHO staff have offered advice and insights on ORS sachet sizing and the WHO Zambia team were invited onto our trial steering group. WTG has offered various speaking opportunities and in 2015 ColaLife was the selected Charity for their Barcelona Conference, resulting in a donation of over £1,000. Staff from the Zambian Ministry of Health have given invaluable help and support since our first visit in 2010. They helped to frame our plans for the original COTZ trial in 2010/11. Following signing of a Memorandum of Understanding (MoU), the Ministry has provided oversight of all of our work in Zambia, also chairing project steering groups and providing vital advice and insights. Health Minister Dr Joseph Kasonde has gone on record to back our plans. By 2015, the Ministry was actively piloting distribution of a public sector version of the Kit Yamoyo flex-pack. See: Order confirmed for 452,000 ORS and Zinc co-packs (05-Apr-2015). The Art Platform has helped by donating a proportion of art and book sales to ColaLife. Art Platform’s founder has continued to support us with personal donations. ColaLife was one of the first organisations to register to crowd-source funding with the Buzzbnk in 2011, and we went on to raise over £3,000. COMESA – the Common Market for Eastern and Southern Africa – co-funded the COTZ trial and through their project TMSA acted as the ‘accountable body’ for our first DfID grant for the COTZ trial – invaluable support for a new, small organisation. They also provided office space, administrative support and employment contracts in Zambia for Simon Berry and Jane Berry throughout the COTZ trial. DEFRA staff ran a strategy day for ColaLife at the inception of the charity and staff have continued to support ColaLife’s progress with contacts and personal donations. Grand Challenges supported our Principal Investigator, Rohit Ramchandani in 2012, during the COTZ Trial, under their Stars in Global Health campaign. We got as far as the last hurdle for their Grand Challenges scale-up fund in 2014, but unfortunately, after a long wait, our bid was turned down by their investment committee. Honda supported Simon Berry through their Cultural Engineers programme, in 2010 with publicity and a generous donation towards transport for the COTZ trial. 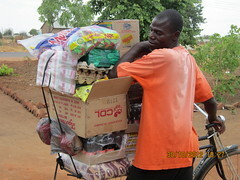 The vehicle purchased with their support is still ColaLife’s only vehicle in Zambia. PATH’s Defeat Diarrhoea team has provided insights, networking and advice and introduced our Kit Yamoyo designs to the UN National Assembly (2013) and Best Buys in Global Health (2014). The Coca-Cola Company agreed to let us ‘piggy-back’ delivery of our earliest diarrhoea kits using space in their crates. This ultimately proved unnecessary to reach remote communities, but helping us to understand their ‘value chain’ and distribution model, especially in Zambia, gave us the breakthrough we needed to design a successful new product and its value chain. TCCC has helped with networking and contacts and covered travel costs while we were planning the COTZ trial. We have continued to exchange experience of last mile delivery in Sub-Saharan Africa. The Funding Network, the UK’s first open giving circle, invited ColaLife to its ‘Dragon’s Den’ In December 2011, where TFN donors pledged £10,260 to help us establish systems in the UK to support our work in developing countries. UnLtd provided ColaLife’s first ever grant, £15,000 to help research and develop our ideas in 2010. This enabled ColaLife founders Simon and Jane Berry to give up their jobs and launch the charity. Nigel Bolding, the Managing Director of The World’s Best Hotels, has supported our fund-raising. He took part in the Boulogne to Biarritz cycling challenge, which funded two planning trips to Zambia in 2010/11. The company also provided free accommodation on trips undertaken by ColaLife staff. Our network of support is constantly changing and expanding. A visual representation of ColaLife’s extended support network during the COTZ trial, 2011-12 is here.